Americana Holiday Santa Claus Shower Curtain from Collections Etc. The Americana Holiday Shower curtain adds a bit a whimsy to your usual holiday décor by adding a holiday touch to your bathroom. 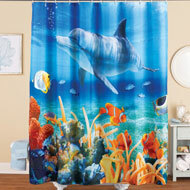 The printed fabric shower curtain measures 70" by 72" and is made from 100% polyester and features steel grommets for shower curtain rings. Machine wash and tumble dry. Polyester and steel. This item ships from a separate warehouse and will arrive in a separate package. 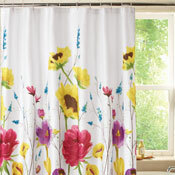 Transform your bath into a beautiful garden with this butterfly decorated shower curtain. 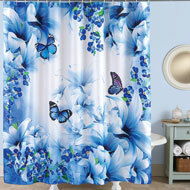 The lovely design showcases blue and purple butterflies on a blue and white floral background. Shower rings included. Machine wash. Polyester; imported. 70"Sq. 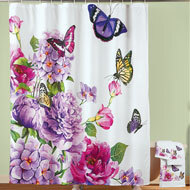 Add an instant splash of beauty to your bath with this colorful shower curtain that features lovely butterflies and a variety of purple, lavender and pink flowers. Hooks (not incl). Machine wash. Polyester; imported. 72" L x 70" W.